Moricand, 1856, J. de Conch. : 178, pl. 7, fig. 10. 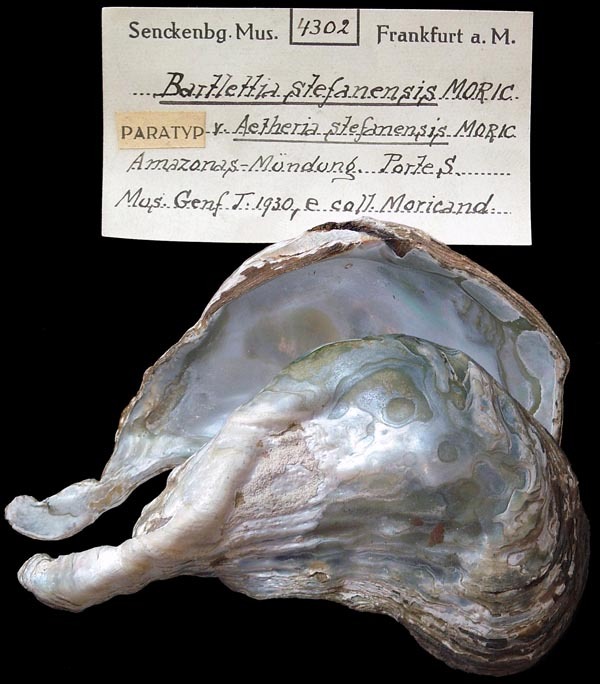 Type(s): SYNTYPE SMF_4302, Amazonas, Mündung [Delta] Porte S.
Bartelettia [sic] stephanensis Sowerby, 1872. Sowerby, 1872, Conch. Icon. : pl. 1, sp. 1. Simone, 2006, Land. Freshw. Moll. Brazil. : 285. Morretes, 1941, Arqu. Inst. Biol. : 76, pls. 31-33. Modell, 1942, Arch. Moll. : 176. Stansbery & Soehngen, 1964, Sterkiana: 10. ‘Moricand’ Millard, 2001, Class. Moll. : 1075. ‘1516’ [Modell] Simone, 2006, Land. Freshw. Moll. Brazil. : 285.